This ultimate head support for preemies and full term babies has been used in hospitals worldwide. Now you can dramatically reduce the chance that your baby will suffer Flathead Syndrome and Hydrocephalis by using the Cinis Preemie Halo™. 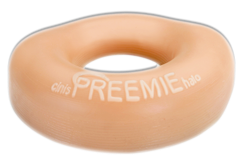 The Cinis Preemie Halo™ was developed in 1998 by a neonatal nurse to help very fragile preemie babies. She designed the Halo as a round, flesh-like cushion that provides the soft enveloping comfort of a mother’s touch while helping with the development of a perfectly shaped head. The Cinis Preemie Halo™ is now being used in many hospitals in the United States.